I'm pretty excited about this new release as it combines history and a murder mystery - my two favorite things! Based on a true story, mystery and intrigue in pre-Civil War New York The sensational murder of Dr. Harvey Burdell in his lower Manhattan home made front-page news across the United States in 1857. "Who killed Dr. Burdell?" was a question that gripped the nation. 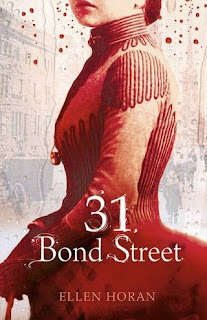 31 Bond Street , a debut novel by Ellen Horan, interweaves fiction with actual events in a clever historical narrative that blends romance, politics, greed and sexual intrigue in a suspenseful drama. The story opens when an errand boy discovers Burdell's body in the bedroom of his posh Bond Street home. The novel's central characters are Dr. Harvey Burdell, a dentist and unscrupulous businessman; his lover, the ambitious, Brooklyn-born Emma Cunningham; the District Attorney, Abraham Oakey Hall (later to become mayor of New York); and Henry Clinton, a prominent defense lawyer. The enigmatic relationship between Emma and Dr. Burdell makes her the prime suspect, and her trial is nothing less than sensational. Will she hang? Were her teenaged daughters involved? What did the servants know? Who was the last person to see Burdell alive? During the trial, the two lawyers fight for truth, justice and their careers. This novel is set against the background of bustling, corrupt New York City, just four years before the Civil War. The author intertwines two main narratives: the trial through the perspective of the defense attorney Henry Clinton, and the story of the lovely young widow Emma Cunningham whose search for a husband brings her into the arms and home of Dr. Burdell. I love this kind of mystery. Thanks for bringing it to my attention! Yes, yes, yes! I'm totally looking forward to this one. Daphne pointed it out a month or so ago and I put it on my wishlist right then. This sounds sooooo interesting! This looks like a book that is guaranteed to capture my interest, so it's going right to the top of the list. Thanks so much for the heads up on this book! Love the cover on this one ! Gorgeous ! I have an award I'd like to pass on to you over at my blog! Totally LOVE this cover!! WOW! There are so many elements converging in this book, it should be a great story. History and mystery are my two favorites, too. I will look for this one. Thank you.